The Good News: Today’s game with the Padres will conclude this dreadful West Coast trip the Reds have been on. The Bad News: The Reds still have to play a game today and can not post a winning road trip. If you are up for it, discuss the happenings of today’s game here.Ã‚Â Since it is a day game, perhaps I can finally watch a complete Reds game.Ã‚Â Assuming I actually WANT to do that.Ã‚Â GO Reds! Titanic Struggle Recap: What, me worry? Morale is low but a win today could put the Reds 4.5 back of the WLBs and 5 back of the buccos (assuming the WLBS finally win one). Those margins are far from season ending. CBS is reporting Molina will “likely” go on the DL. I love how the cardinals pulled a Reds-medical-staff on that one. a) guys swinging at soft stuff WAY outside the zone and either popping it up or hitting harmless grounders to the infielders. b) the seemingly daily dose of TOOTBLAN. c) the well meaning but sometimes downright puzzling Dusty Baker game management. That being said, with the quality of pitching, it sure seems like they should be winning some of these close games instead of losing most of them. Today is as good a day as any to start a winning streak… GO REDS. Well the Padres will be down a reliever after sending Thatcher to the D-Backs in the Ian Kennedy trade, leaving just 1 ineffective LHP in the bullpen for today. @Shchi Cossack: Is there such a thing as an ineffective LHP versus the Reds? While the Reds will be looking to bust out of their slump, Padres pitcher Eric Stults will try to sink them even lower. And with the way Stults has pitched at Petco Park this season, there’s a good chance of that happening. The 33-year-old left-hander has gone 5-0 with a 1.35 ERA in his last seven home starts, limiting visiting teams to a .173 (32-for-185) batting average. San Diego won all eight of Stults’ last eight home outings dating back to April 27. Stults is likely happy to return to Petco Park after giving up seven runs (five earned) and 11 hits in just five innings at Arizona on Friday. Looks like the Reds are staying put for the trade deadline. Wouldn’t mind to see them grab Morse for a pitcher like Lotzkar. I’m glad to see Choo sitting again today. I don’t think he had any business playing yesterday on a bum ankle, even in LF against a RHP, but playing Choo against a LHP today would have been utterly ridiculous, even for Dusty. I hope Mesoraco enjoys his rest today with Dusty looking out for Mesoraco’s best interest and making sure he doesn’t get too much time behind the plate or at the plate. Today was a perfect time to bump Bruce back up to the cleanup spot behind Votto, with the Padres having only 1 ineffective (7.20 ERA & 1.40 WHIP) LH in their bullpen, but sadly no. @Shchi Cossack: Only Adam Dunn and Travis Hafner have lower SLG than Phillips of guys that have spent meaningful time in the #4 spot. Will Dusty move him when Ludwick returns? @Shchi Cossack: The only thing I can figure about Mes sitting today is that Homer Bailey HATES pitching to Mesoraco. I had a dream that I woke up and checked twitter and saw that Latos had turned himself in to the MLB for being a part of the Biogenesis scandal. Like, John Fay, Buster Olney, and Ctrent all made twitter appearances in my dream. Freaked me the heck out. So, one positive we can take from today is that my dream did not come true. Hopefully the Reds can take that momentum into the game today. Go Reds. Hopefully the Reds can score a run or two for Homer. But the combination of (a) the slump, (b) the left-handed pitcher they face, and (c) it’s Homer’s start, makes me concerned whether they will score at all. @Steve Mancuso: As most people know, I am very, very optimistic about the Reds, almost to a fault. I rarely get down on them. Still, considering what you mention above (points ‘a’, ‘b’, & ‘c’), my bold prediction is a 3-1 loss to the Padres today. If the Reds move on a guy like Lopez (yes, please), it’s a likely indication that Marshall is doubtful the rest of the year. Morse–as a pending free agent, this seems like an obvious fit, and a hedge against Ludwick ineffectiveness. Surely a couple C prospects would get it done? The pressure methinks is on the Pirates to get something big done. Their lineup as currently constructed will get owned in the playoffs. @Sultan of Swaff: I don’t know if a couple C-prospects would get a deal done for Morse. There is also interest from a couple other teams, including Tampa Bay. They have some prospects they could spare that would be on par with some of the better ones the Reds have. It may be hard to get something done for Morse with Tampa being one of the suitors. I’m so ready for the trade deadline to pass. Does that happen at 4:00 easern time, I hope? The current conditions in MLB as define by the most recent contract with the MLBPA, has made the trade deadline much less exciting and meaningful. Teams are getting smarter in locking up their own prospects and not signing lont-term contracts that become albatrosses, so the available talent has dwindled in borth quality and quantity, but the asking prices by the designated ‘sellers’ has inexplicably increased. That should make for more interesting off-season transactions. @Shchi Cossack: Yes deadline at 4 your time, 1 out here on the West Coast. 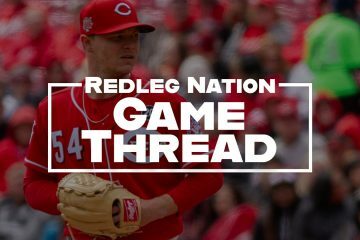 From Dusty: Reds are due to win, and Homer is due for a win, these things point to a Reds win. Bud Norris to the Orioles for L.J. Hoes and a Comp. B Pick. Orioles so far are the winners of the trade deadline. @lukeukcrazy: If the Reds don’t make it, I’m pulling for the O’s this year, all the way, hopefully in seven, over the Dodgers. Oh, it’s Eric STULTS. I thought the kid from Mask was on the mound for the Friars today. Wow, could Joey trot any slower to first base ? @vegastypo: I’m fine with him trotting along on a routine grounder to second. Well at least we are actually hitting so far. It’s fun when Corky does get one, b/c the outfielders always seem paralyzed with disbelief. oh boy, frazier, cozart, miller, the pitcher….”hey” dusty would say, “just gotta let em work thru it”…even if it takes all year…. cuz this braintrust has no balls to do anything dramatic. meanwhile Chapmans stock will plummet with each dog day that passes. poor choo has a boo boo…sheesh, wouldnt want to make matters worse, never mind he’ll be leaving in a couple months anyway…oh dont worry Frazier will turn it around, look at EE in Toronto, sometimes it just takes ten years…and no Cozart is not Juan Castro or Paul Janish we promise, you’ll see, he’s the future. And Ludwick will be back soon to lead us to the pennant. trade chapman! we dont need him! SORRY had to vent with a little SARCASM…thanks go reds! someone said that everyone should try bunting…IT’S WORKING!! stealing 3rd?? with Votto up?? @VaRedsFan: the first Reds TOOTBLAN of the day… if you’re going to steal 3rd in front of Votto, you just have to be sure and make it. Doh! Look at that.. Lets steal third with votto on… now we need a hit.. instead of a garanteeded run.. Does it seem like everytime a runner is thrown out stealing, that one of the next guys get a hit? My anger at Robinson’s steal attempt is lingering. What is the statistical probability of getting three hits in one inning and scoring at least one run? And what is the Reds percentage relative to the aforementioned outcome? I have no idea, but it feels like we would be below the league average. @Bruuuuuce: Depends who’s getting the hits. If it’s the 2013 Reds, the probability is about 70%. Reds offensive woes continue and jocketty did nothing to shore it up! Brutal! Someone poke jocketty and see if he’s breathing. @santa barbara reds fan: What, is he supposed to FORCE other teams to make a reasonable deal? @santa barbara reds fan: Alderaan is destroyed and yet Jocketty does nothing. Thom and Chris, doing schtick. Trying to steal 3rd with no outs and the heart of the order coming up ? Doesn’t Robinson have a stop sign ? Trade deadline was dead. Pirates tried to get Trumbo, that would have been a game changer. No way LA Angels trade Trumbo. He is a native of Anaheim, CA. He and Trout are the present and future of that team. Pirates would have had to give up G Cole to get Trumbo and that wasn’t happening. @WVRedlegs: I agree, but you have to give the Pirates credit for trying to make it happen. So far so good Homer. I wonder if Frazier will ever get another hit in the major leagues. @rfay00: He had a hand injury to begin the season, and one realy bad month. Sometimes, stats can be deceiving. It feels like Ground Hog day again. After helping Stults get thru the 3rd, the Reds offense goes into their 1-2-3 inning mode. Man. I did like it better when I could sleep through these. Lots of fastballs from Homer. @Steve Mancuso: Which is good. Two IF hits and Homer gets out of it, nice job. Marty saying that during this losing streak, that without exception some Red does something dumb. Really? I don’t understand how this guy has a job. @CharlotteNCRedsFan: Marty or the Red who did something dumb? Homer swinging away on 3-1? Homer swinging away on 3-1? This team is pressing. Strikeout on 88 mph “heater” down the middle. Odds that any of the beat reporters will ask Baker if he sent Robinson on the stolen base attempt? @Steve Mancuso: No chance. Welsh was already pinning the entire blame on Robinson alone. Nobody @ the Enquirer will ask. @Steve Mancuso: The sad reality is that the only beat reporters who can get by with asking the types of questions we would all like answered work in mega markets like New York, Chicago, LA and a very few others. Though none would want to admit it, it’s a fact of life that reporters in small markets can be shut out to the point they lose their jobs by asking questions that bother the powers-that-be. There’s a section for the Reds beat writers. Commenters are echoing the no hard questions asked theme. We’re not the only ones to notice. 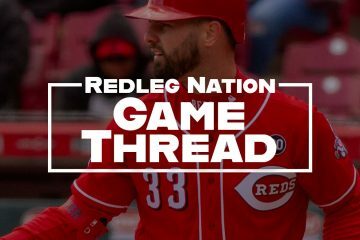 @RedLeg75: The fact that the Reds have only three beat writers is enough to let you know why questions aren’t asked often that could be considered abrasive to management, ownership and even the players themselves. It’s easy for a website such as deadspin.com, or anyone else for that matter, to offer up criticism of those beat writers when none of them have to walk in their shoes. Homer needs that 1 run to stand. No pressure though. @CharlotteNCRedsFan: With the Reds offense, this is like pitching a no-no, pressure wise. On the bright side, the Reds broke their first-pitch slump today with Cozart’s bunt single. Proving that every 60th or 70th time the Reds swing at a first pitch, something good happens — as long as the “swing” is actually a bunt. @Baseclogger: Sounds like an interesting post. Any easy way to collect the actual data on this? @Steve Mancuso: I asked yesterday if anyone knew an easy way to find out the last time the Reds got a hit on a first pitch, but nobody responded. I’ve been informally following it for several days now, and the last one I remember before Cozart’s bunt was in San Fran. But I don’t know the actual stats. Score some runs, no reason for this game to be close. Votto-double, BP – groundout, Bruce Bomb! Come on Jay, how bout some breathing space. Is it possible the Reds could lose 4 consecutive walk-offs? @Hunt4RedsOctober: It’s possible, but yesterday they didn’t. @Baseclogger: I went to bed and didn’t realize they lost it in the 8th instead of the 9th. Same difference. That was the worst trade deadline I’ve ever seen. Nothing happened. Talk about a buzz kill. Just throwing changeups to Bruce and Frazier, letting them get themselves out. One thing that doesn’t get discussed. The one negative of the Mat Latos trade letting Yonder Alonzo go. They really could have used his bat. @Larry1980: I’d rather have Votto. The Reds aren’t allowed to use a DH and he was an awful LF. @Larry1980: still nowhere to play him. 21 consecutive plate appearances for Todd Frazier without a hit. I just don’t understand not trying to shake things up. @bohdi: Baker’s stubbornness is not one of his best qualities, in my opinion. I don’t know why anybody would ever throw Todd Frazier a fastball ever again. He’s such an easy out. 97 mph heat from Homer. He doesn’t want to lose today. It’s unbelievable how bad this offense is right now. It’s like Kershaw put a spell on them or something. Bailey really turning it on now, throwing smoke. Homer is in Beast Mode. Six strikeouts, no walks, four singles (three infield) given up by Homer. 97 mph fastball followed by a slider for the K. Homer putting on a clinic. Hope he can go at least 8. @pinson343: 86 pitches for Homer through six. Should be good for eight if everything keeps going OK. Still impresses me how he slowly dials it up as the game goes on. Do u pitch hit for Bailey or leave him in? A shutout from Homer would be the thing. But he’s up to 86 pitches. Corky Miller is not a Major League hitter, but he doesn’t deserve to get an Ewok’s strike zone. the reds starters have had a 1.95 ERA during the 5 game losing streak. I wonder if that’s a record. I am stunned they scored. And the string of 5 straight “famine” games comes to an end! What’s with all the Reds running around the bases? The announcers are talking about these things called “runs”. Wow, 4 runs? What the heck is that? I thought you were only allowed to score 2 runs. Nice. If there’s any consolation from the first two losses in this series, it’s that their bullpen got heavily used, and they stuck with Stults today, when he was obviously losing it. O dont you worry I am sure we will see chapmen for sure today..
I’m confused by this inning. Seems like Reds are the team at bat, but they keep scoring runs, so I don’t get it. When is the last a Red’s pitcher has pitched with more than a 1 run lead? Greg Reynolds made it through the waiver process…wow. @rfay00: That’s not real surprising. He doesn’t have a whole lot of upside at the major league level. I’d go ahead and pitch Chappy in the ninth today regardless of score. Need to keep him sharp for the St. Loo series. @homerandbruce: I trust Chapman with a 4 run lead against these guys. @homerandbruce: dont worry we are winning by more then 1.. chapmen will pitch today. got to get that save..
Great play by Heisey there. Did I say Homer wants this win ? At least with a win, the Reds will gain a game on someone. They will also gain a half a game on someone tomorrow. @Hunt4RedsOctober: Hate to root for the St. Loo’s but would like to see them win the next two against the Buccos. The Nationals lost 11-1. As bad as the Reds have been. The Nationals are 4 under and 10 1/2 games out of the N.L. East. As frustrating as the Reds have been playing. Things could be worse. But, but, don’t they have Harper and Strasburg? I have to admit guys, as bad as the team has looked offensively the last couple series.. if they get hot starting now and carry that over into the Cards series? I would take that with no hesitation at all. @Mwv: After that day off, I think BP stays hot. That’s it, Dusty, step up the running game. Is there a base-running school some of these guys can get sent to, kinda like the equivalent of traffic school? @vegastypo: As far as traffic school goes, they haven’t been fined for speeding (smiley face). Nice time for a DP. So if we get the W tonight.. who are we rooting for between cards pit? @Smithy: a 32-inning game eventually won by the Pirates, I guess. @vegastypo: 32 innings and won by the (I can’t believe I’m saying it) the Birds. Complete game? Nobody is really squaring him up that I can tell. @Mwv: Too many pitches. And I’d like to see Chappy pitch so he isn’t rusty for the WLB’s. @homerandbruce: Probably the wiser choice, I just like to see complete games. @Mwv: Looks like you’re gonna get it. I like seeing complete games too. Just don’t want Homer to throw 120 pitches and then potentially see Chapman on Friday night in a high leverage situation not having pitched since Monday. @homerandbruce: So if we get the W tonight.. who are we rooting for between cards pit? What does WLB stand for? i assume the cards but i just not putting the slang together on them? @Smithy: WLB= Whiny Little Bi****s. As in, “I hate those guys, they’re nothing but a bunch of whiny little *******.”- Brandon Phillips on the Cards, circa 2010. Ah got yeah thanks for the 411..
I’m not sure what I’d do in the 9th. Right now I trust Bailey to finish this game a lot more than I trust anyone in the bullpen. On the other hand, Chapman needs the work. But of course Chapman isn’t allowed to pitch unless the lead narrows to three, so it’s a moot point. @Baseclogger: The Book has solved your dilemma! @wildwestLV: The Book makes life so easy. No thinking required. Really bad managing trying to get a shutout with over 100 plus pitches just because your under worked closer cannot get a save. I think the team needs Chapman out there to get some confidence more than a 5-10 pitcher needs the shutout. He’s got 2 no-hitters who cares about the shutput anyway? Finish this Homer. Finish it. Kotsay still lining the ball the other way. Remember how he used to do that against Cordero, on outside fastballs, for walkoff hits ? Talking about 2011. When was the last time the Reds had a series WIN (not split) against a team that’s currently over .500? Just asking. @ToledoRedsFan: Pie-Rats at home before this road trip. @msanmoore: How many series wins against over .500 teams have they had this season overall/how many such series have there been? What’s the ratio? It seems like they’re abnormally good against bad teams but abnormally bad against good teams. Nice job pitching by Homer, would look even more impressive if the starting pitching had not been so incredible on this losing streak. @pinson343: Speed has always been one of his best weapons. Yeah, Homer sitting at 107 pitches. I’d like to see Chapman come in and finish it, especially considering the Reds are off tomorrow. Of course it isn’t a save situation and with the way Chapman has been pitching lately and the way Bailey is pitching right now, maybe Dusty thinks that Bailey gives the team the best chance for a much needed win. @LWBlogger: At no point does the question “who gives us the best chance to win this game” enter his mind. @Baseclogger: Correct. He’s not thinking at all at this point. The Rules say Chapman can’t pitch unless it’s a save situation, therefore Chapman shall not pitch. @homerandbruce: Chapman recently closed a game in a non-save situation, when Mike Leake was taken out with 1 out in the 9th. One more base runner and it would have been a save situation, but he didn’t wait. @pinson343: You’re right. He does sometimes use him in non-save situations. Just not often enough to keep him sharp. Boring. I hope Joey goes deep off this guy. Glad Miller is on third. Gives him a decent chance to score on a base hit. Teams just aren’t going to give Votto pitches to hit. Good news everyone….Dusty saved Chapman for this 2 out save. @Nathan in Lebanon: Really? Geez. Slide piece for the win!! Feels good to get a W.
i guess is a W is a W… Think it was kinda silly to leave baily out there when chapman is WELL rested.. But w/e See you guys back at GABP and on to the WLB as they are now known to me..
See. Chappy actually can pitch when used on a regular basis. And I’ll be breathing a lot easier if he has to enter Friday’s game knowing that he pitched today. @homerandbruce: Yes. Also, he loves to pitch at home. The Cardnals will not give him a problem. Slider by Chapman to end it. Chapman now tuned up for the Cardinal series. I didn’t have a problem with Dusty leaving Homer in until someone got on base other than by an error. Just curious if Alonso swung at ball 4, could not see the game. @pinson343: Homer would probably be 10-6 or even better if the Reds would get him 3 runs a game, much less 4 !! All right everybody relax take a pill and chill. Till Friday night. Joey Votto is a great interview. Love his short talk just then about this game and the five-game losing streak. Tonite, for the first time in many years, I’m rooting for the WLBs to win. Who said we weren’t gonna add an outfield bat? We just landed Brandon Short!!!!! Yes, that was five exclamation points. Offensive woes are over!!!!! A very much needed win by our favorite team. I guess I am the only person that noticed our favorite future manager Corky Miller notched his 100th Major League hit today. I thought that was awesome!